One of the delicious things I discovered about Lundy as part of my UK Island Project, is its status as having the longest running private postal service in the world. It was started in 1929 by Martin Coles Harman, who owned the island at the time and from what I've read about him, he was quite the entrepreneur. This discovery really struck a creative chord with me. I wanted to know more about the stamps, the artwork and artists who created them. Was there a collection of artwork and stamps? If so – Where were they? Turns out that the Landmark Trust, who’ve cared for Lundy since 1969, had a collection which they’d given to the British Library. Right I thought. I need to go to the British Library. I wasn’t able to fit it in last year, but finally went last month and was able to meet up with two friends at the same time. Stamp artist Scott Thomson who runs Positively Postal and Illustrator/Comic creator Michi Mathias (do check out her current project: A graphic novel based on a 1897 travel adventure called Cycle and Camp). I’ve known Scott online for a few years as we’ve done some of the same 30 Day challenges, but we’d never met in person. This was the perfect opportunity. To see a collection at the British Library requires an appointment. I’d been in touch with Paul Skinner head of the Philately Department and on arrival had to enter via the Staff entrance at gate 8 to collect my special pass from security. I was met there by Richard Morel, Paul’s colleague, and taken up to the third floor where the stampy treasures are kept under lock and key. The room was compact and filled with boxes and files. A trolley full of Lundy stamps and artwork was there waiting for me. I was to have an hour or so to myself before meeting Scott and Michi at lunch. 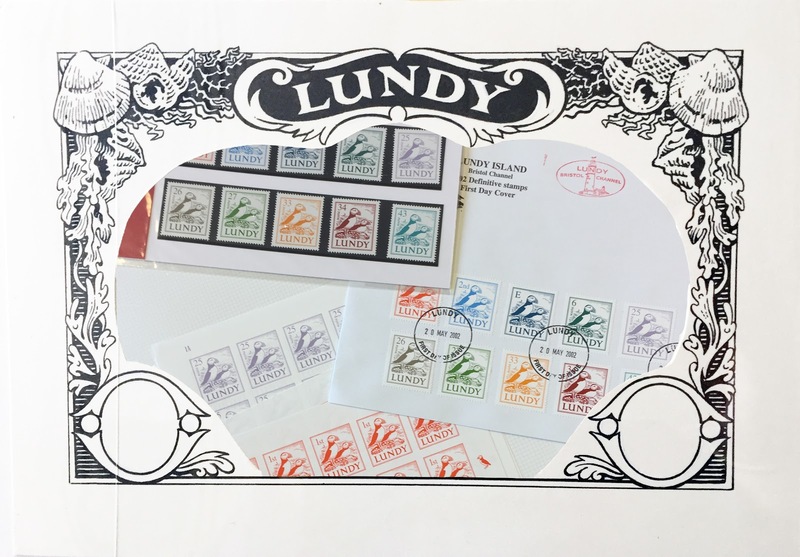 The British Library holds two collections of Lundy stamps – The Landmark Trust which I’ve already mentioned and one by an avid collector called Chin Chie. Chin Chie’s collection consists mainly of sheet upon sheet of stamps which actually looked fantastic all together. Something about the image repeated and the perforations made each sheet a work of art in its own right. Lunch called. Time to meet my friends. Having already been up to the philately room I was entrusted with getting us back there to ring the bell and be let in. That didn’t quite go to plan. We got the passes, went up in the lift, exited the lift and then promptly got lost. We found ourselves in the ‘behind the scenes area’ of the library with lots of corridors and books but no one around. All the desks were empty…Finally someone walked past us and we could ask for directions, but they were new and didn’t actually know where to send us, so she went off to find someone else. We stood about giggling nervously as it was rather comical and typical for me to get lost so easily. Eventually she came back with a colleague who proceeded to take us back to where we’d gotten out of the lifts and took us through an opposite set of double doors. Here I realised my mistake. I’d turned left when should have turned right. Suddenly we were back in the Public library and a familiar space! Hurrah now I knew where we were. After introductions we sat down at the large table and more boxes were lifted out of the trolley. Two folders in paticular were full of artwork. One name that kept cropping up on the stamps was John Dyke, and now here in front of me I could see his exquisite artwork. Some in pencil, some ink and some in what looked like gouache. Some pieces were around A6 size and very detailed and vibrant. Looking at the original artwork and then the stamps I have to say that some of the impact is lost when reduced to stamp size. Being able to see the actual artwork in its original state was a real thrill. There were some fragments of information about John Dyke on the backs of the first day covers, but not a great deal. I’ll have to search elsewhere for that. 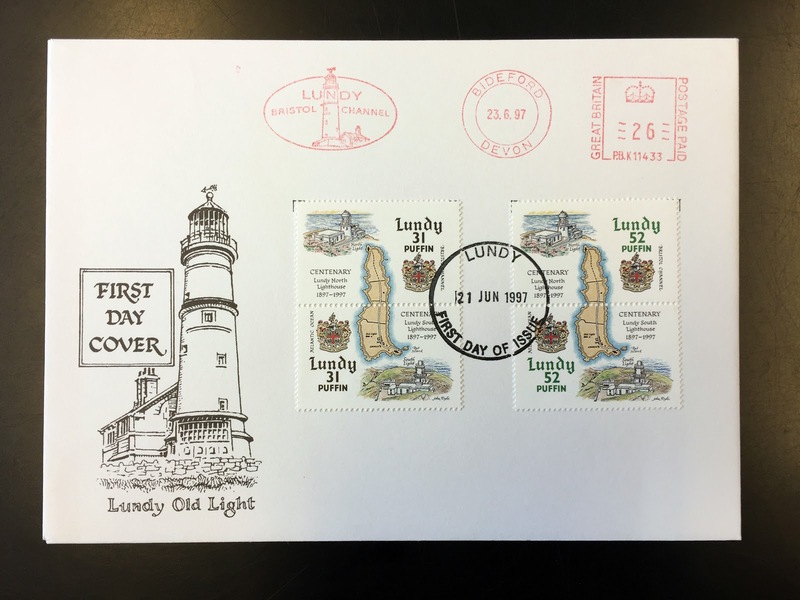 Richard, who has a particular interest in the stamp artist Victor Whitley, discovered that he’d actually designed two stamp sets for Lundy. It wasn’t just me discovering something new that day! It was fascinating hearing Richard and Paul talk about the history of stamps, their role in capturing social history, the most expensive stamp in the world (The British Guiana 1 Cent Magenta that sold for £10m as there is only one in existence), stamp forgery (which was rife during the 1900s) and learning about other artists who’d designed stamps. I hadn’t appreciated how much a stamp could tell you. Having seen the Lundy stamp artwork it occurred to me that actually, I’d like to create some stamps myself. Handy that Scott already does this...! I have to say a huge thank you to Paul and Richard at the British Library for being so brilliant, helpful and kind. It really was such a fun and fascinating day at The British Library! Or, to an impressive library somewhere else in the world? PS – Thank goodness I asked Mr CA to read this though. Otherwise we’d have ended up at the Phallus room.